VBoxRawdisk is a small utility that makes it a little easier to generate the raw disk (VMDK) file required to load a real disk drive into VirtualBox. It implements the steps described in Section 9 of the VirtualBox manual - 9.9.1.1 Access to entire physical hard disk and 9.9.1.2 Access to individual physical hard disk partitions, running VBoxManage to perform the steps based on data you supply via VBoxRawdisk. When the utility is initiated it scans the physical drives attached to your Mac and presents a table similar to that used by Disk Utility. When a drive is selected, key attributes of that device are displayed, enabling you to determine which drive contains the data you wish to use in VirtualBox. VBoxRawdisk also reads the VirtualBox registry to determine which virtual machines you have configured. When a disk has been selected, the menu of virtual machines is enabled and you can proceed with generating the VMDK file. This is dangerous stuff and there is a very real risk of destroying data if you inadvertently choose the incorrect virtual machine, incorrect partitions or the wrong disk. Be warned!! Entire physical disk access is on the whole easier to use than accessing individual partitions and seems to have (slightly) fewer caveats. All partitions on the disk are available for use by Virtual Box. This is difficult to configure. 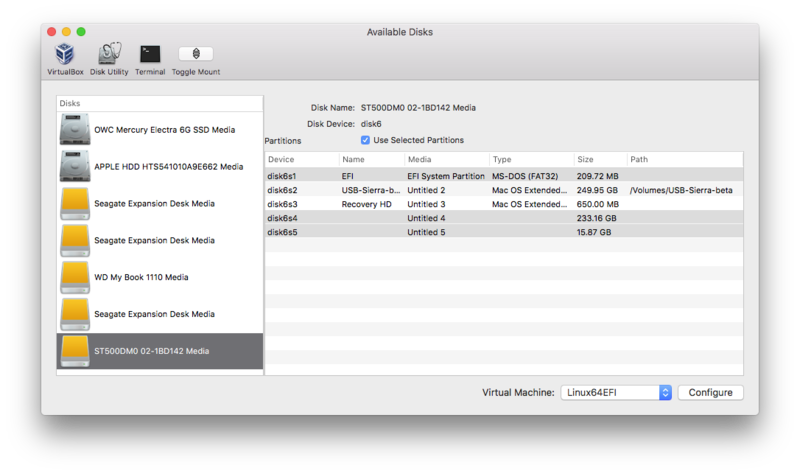 In VBoxRawdisk you select the partitions that you wish to use. Use command-click to select multiple partitions. Running VirtualBox under macOS, the VMDK file MUST be attached to an IDE controller. It just doesn't work when attempting to attach to a SATA controller. This may be a bug in VirtualBox. For now, VBoxRawdisk does this attachment to IDE for you. In general, you will need to use 2 partitions, the EFI partition (containing boot strap code) and the partition containing your OS. If you are attemting to run Linux as the guest OS, you will probably also want to add a small partition for use as swap. The VirtualBox manual indicates that it's possible to embed the bootstrap code inside the raw partition, but I have been unable to get this to work. Again, maybe a VirtualBox bug. I found it easier to initially configure individual partition access after having first made the host bootable from the partitions that will be used by VirtualBox. Its a bit of a chicken/egg situation and a lot of mucking around but the advantage is that you can then either run the guest OS virtually or alternatively, boot the hardware and run the OS in native mode. VBoxRawdisk does not create a virtual machine - you must use VirtualBox to do that, creating a new machine configured as required for the OS installed (or to be installed) on your raw drive. VBoxRawdisk will present a standard 'Save as' dialog for saving the generated VMDK file to somewhere on your machine. The default file name will be the same as the name of the selected virtual machine, so make sure you have selected things as you intended. VirtualBox requires ownership of the system device files (/dev/diskn*) associated with the selected disk. By default these device files are owned by the root user. You will see an authentication dialog enabling this change of ownership. Once created, your VMDK file will be added to the VirtualBox media registry. You can now cancel further operations in VBoxRawdisk and manually (i.e with VirtualBox) attach your VMDK to your virtual machine. VBoxRawdisk will optionally attach your VMDK to either SATA controller 0, port 0 (entire disk) or to an IDE controller (selected partitions). You should add the appropriate disk controller to your virtual machine configuration. VBoxRawdisk will optionally attempt to start the virtual machine. Sparkle updated to version 1.21.2. Check device permissions before propmpting to change. Relaunch if VBoxRawdisk has been translocated. VBoxRawdisk is now notarized by Apple. Built with Xcode 10, Swift 4.2. Use raw partitions (previously only entire disk). Access to system utilities (Disk Utility and Terminal) from the toolbar. Option to start VM headless. VM menu sorted by most recently used.